Israeli soldiers abducted, late on Sunday at night and at dawn Monday, at least 32 Palestinians, including more than twenty political leaders and members of Fateh movement, from their homes in several communities in occupied East Jerusalem. 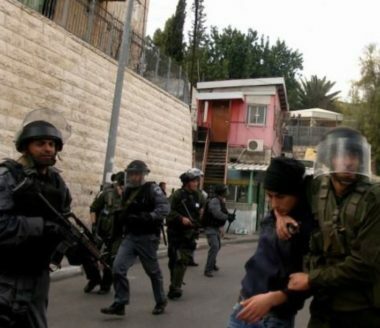 Media sources said the soldiers invaded and ransacked dozens of homes and interrogated many Palestinians in several neighborhoods and communities in Jerusalem, mainly in Jabal al-Mokabber, al-‘Isawiya, at-Tour, Wad al-Jouz, Silwan, Beit Hanina and Shu’fat refugee camp. They added that the soldiers closed entire Palestinian communities before invading them, and initiated extensive and violent searches of homes, while military helicopters hovered overhead. The abductions came less than one day after the army abducted Jerusalem Governor Adnan Gheith, from his home. The soldiers also summoned many Palestinians for interrogation, and broke into the home of Ibrahim Jolani in an attempt to abduct him, but took his son prisoner instead because Ibrahim was not at home during the invasion. The abducted Palestinians were part of a nonviolent procession, held on Sunday in Salaheddin Street, in Jerusalem, demanding the governor’s release.